John Glenn was an American hero. We don’t have many of those anymore. In a day and age where we tear down people as quickly as we build them up, he might be one of our last. I cried a few tears Thursday when the news came that he had died, even though his passing was inevitable. He was 95, after all. Photo courtesy of Mark BoxleyWhat a life this man led. His accolades are mind-boggling. War hero as a Marine Corps pilot. Husband (for more than 70 years!) and father. And simply a nice person, who I was fortunate enough to meet several times. He flew 59 combat missions in World War II. He added 90 more in Korea in the early 1950s. He broke the transcontinental flight speed record in 1957. In 1962, he risked life and limb to leave the Earth and do something that would have been unthinkable a decade before, with technology that we would scoff at today. He became the first American to orbit the Earth in 1962, immortalizing him forever. He was a space pioneer in a day when it truly was the final frontier. In 1998, at age 77, he became the oldest man in space aboard the shuttle Discovery. In between those visits to space, he kept himself busy … 24 years in the U.S. Senate (he was still a senator when he went back into space in 1998!). A potential vice presidential candidacy in 1976. A presidential run in 1984. In fact, as a 10-year-old, on April 21, 1983, my father took me out of Medill Elementary School in Lancaster, Ohio, and he and I sat in the gym at John Glenn High School in New Concord, Ohio — Glenn’s hometown — and watched him announce his candidacy for president. His presidential campaign, despite his amazing resume, was hurt by a fatal flaw for candidates even 30 years ago — he simply wasn’t a gifted public speaker. Still, it was hard not to like and admire John Glenn. He was a small-town boy with from New Concord, a great athlete with all-American good looks. His childhood home is now a museum, and I was fortunate enough to tour it years ago when I was the editor of a newspaper about 20 miles away. What is striking about it is its simplicity. The home is not large by any stretch. The museum is not gaudy. He was a simple man from a simple upbringing who achieved extraordinary things. He married his high school sweetheart, Annie, in 1943. She, too, overcame a challenge — a horrible stutter, to the point where she could barely communicate at times. She finally found the proper treatment in 1973 — at age 53 – that helped her overcome it, to the point that she regularly gave public talks. Indeed, John Glenn saw his wife as a hero. What a love story they shared. And, in one of the wonderful twists of history, Ted Williams — yes, the “Splendid Splinter,” the greatest hitter of all time, the Red Sox outfielder and Hall-of-Famer — was in his Marine squadron during the Korean War. “Ted flew as my wingman on about half the missions he flew in Korea,” Glenn told mlb.com when Williams passed away in 2002. We will not see his like again. With his passing, we have lost a great American. A true hero, in a time when that word is thrown around more than it should be. 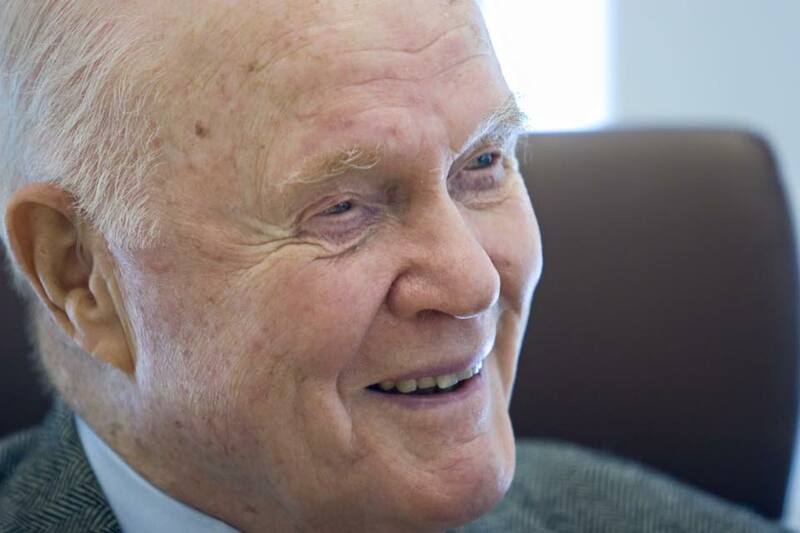 “I think John Glenn will be remembered as an actual hero at a time when heroes are often called heroes but are not,” Francis French, the author of many books on the space program's early days, told NPR. Jason Maddux is editor of the Press And Journal.